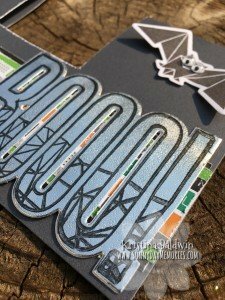 As promised, here is another fun project using the Cats & Bats Scrapbooking Stamp Set + Thin Cuts dies. 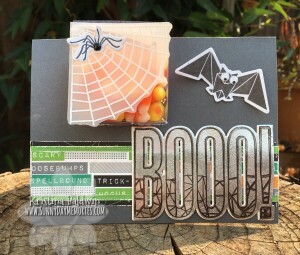 This Booo Box Card is not only a card but a fun treat, too! 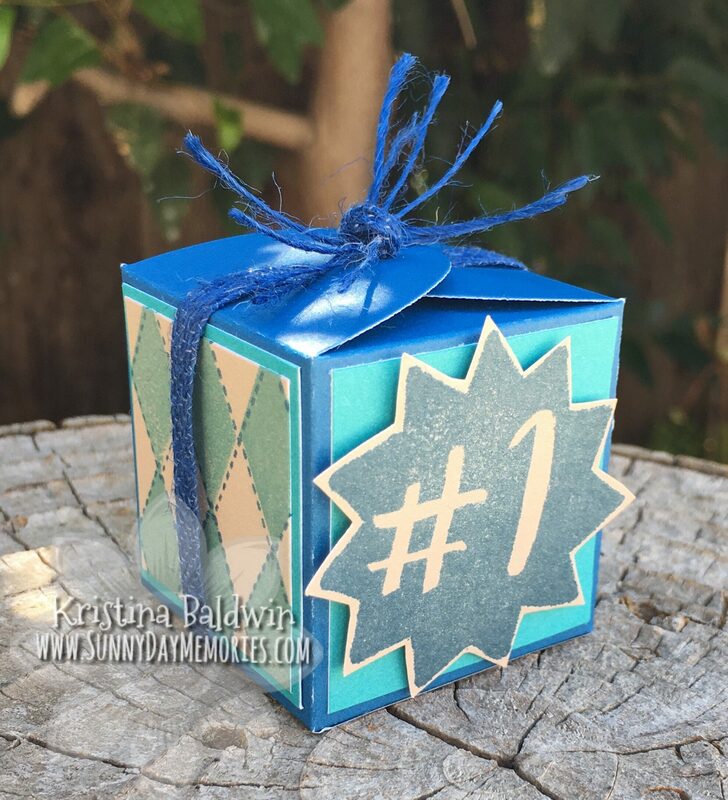 I had a lot of fun using both CTMH’s *NEW* Silver Foil Paper and Vellum Paper. Each had a great effect when I embossed on them. I chose to do a White Embossing for the spider web on the Vellum Paper and then I trimmed it up and selectively used a Glue Dot behind where I was going to place the spider (which I trimmed up after cutting out with the die.) I added a little Cats & Bats Black Dot to create more dimension for the body of the spider–love it! For the Booo sentiment, I stamped in Black pigment ink and then used the Clear Embossing Powder. Instead of tapping away the excess powder, I left it and totally LOVE the look it achieved on the Foil Paper. It’s sort of all bubbly and crackly looking which ties in beautifully with the design of the stamped image. Finally, I followed the design of the outside in the inside for consistency. 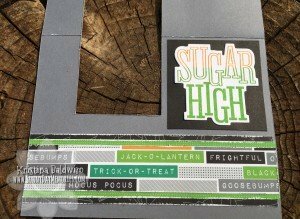 I also couldn’t resist stamping the “Sugar High” sentiment from this set as it totally was spot on with the box of candy corn that’s attached! This super fun card design is one we will be creating at our Holiday Extravaganza next weekend. If you’re interested, you can sign up to get your very own kit of all 8 projects we’ll be creating. Plus, it’ll be shipped directly to you complete with pictures and step-by-step instructions. How fun, right? To get your Holiday Extravaganza Kit, click HERE. This entry was posted in 3D item, CTMH Card Ideas, Holidays and tagged Close To My Heart, Events in SF Bay Area, Holidays, stampers, Thin Cuts, Tips and Techniques, using clear stamps card making. Bookmark the permalink.